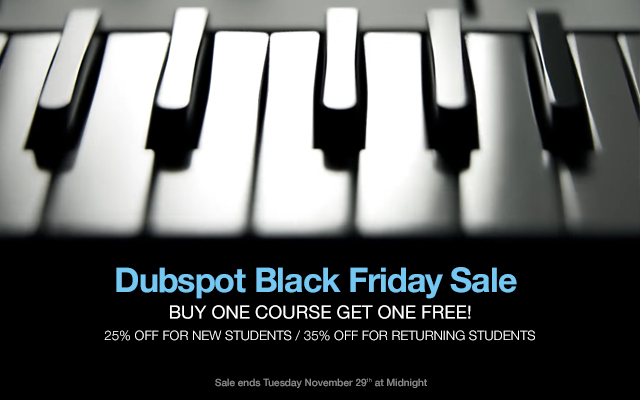 Dubspot Black Friday Sale: Buy One Course, Get One FREE! Treat yourself or your loved music enthusiast this holiday season to the gift of learning. Dubspot offers the essential knowledge to transform your musical ideas into new creative heights through our many extensive programs. New students save 25% off all courses and returning students save 35% off. As a bonus we’ll give you one FREE course of your choosing when you enroll. Sale ends Tuesday, November 29th at midnight. Enroll Today! Do More Than Just Listen! We offer a unique blend of courses tailored to help you develop the deep skill set you need to achieve your musical goals and meet your schedule needs. Find your passion for creating music in our Music Foundation’s, Music Production, Mixing and Mastering, Sound Design, and DJ Programs. Join the world’s leading learning environment and community for musicians, DJs, producers, visual artists, audio professionals, and enthusiasts of all music genres. As a premier Music School for both aspiring and experienced artists alike, Dubspot’s mission is to inspire and enable students to achieve their creative goals. Classes are kept intimate in hands-on lab environments and are designed to teach you the powerful functionality of today’s leading music technology while guiding you through fundamental concepts to advance your skills and apply them creatively to develop your signature sound. Our talented tribe of musically diverse educators are more than talented musicians; they are mentors who are devoted to seeing students develop and grow as artists. Their collective experience in the music industry spans many fields, continents, and years. They are the heart of your Dubspot experience! Dubspot can provide the knowledge and guidance you need to advance your music. Learn more about our extensive online programs and start dates below or call us at 1.877.DUBSPOT. Did you know that Dubspot offers gift certificates for our programs? Give your loved one the gift of knowledge and launch them into new heights of creation this season with one of our extensive music production or DJ courses. Any Dubspot program, course, or weekend workshop can be scheduled and wrapped into a gift for your music lover. We can even arrange private one-on-one sessions with our instructors at an affordable price. Call 1.877.DUBSPOT (1.877.382.7768) for details.